I've been reading some more on Calvin Coolidge and here's another anecdote I'd like to share with you. Apparently, when Coolidge was Vice President, a young secretary was summoned to see him. "Miss Peck, you're a lovely young lady," said Coolidge. She seemed startled by the remark, but he continued, "Yes, you're very attractive." The secretary was surprised by the statements and a little stunned. Then he continued, "I'm telling you this young lady, to get you cheerful, because I'm going to make a few remarks about your punctuation!" 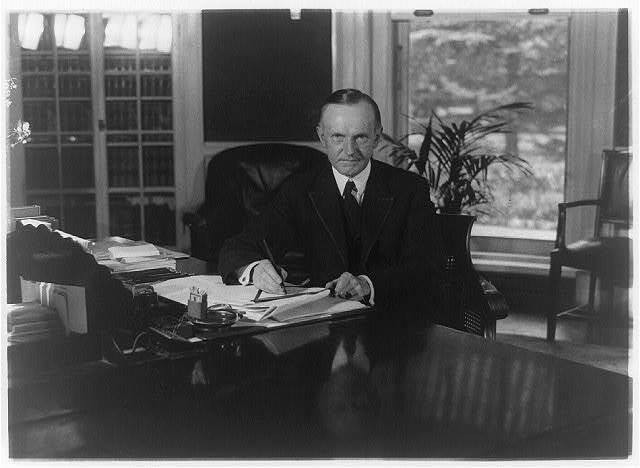 Thanks for the great remarks about Coolidge. I'm reading about all the presidents but haven't gotten to Coolidge yet. I am now looking forward to it! LOL. Thanks, Nate. We're in your state for 4 days! Just toured Cabrillo Nat'l Monument. Judi, you're headed the wrong way, I live north of there. Although my Maas grandparents are buried at the cemetery you drove through to get to the monument. It's pretty out there isn't it? Good quote! Your right about the keen sense of wit. I bet Silent Cal could be pretty funny behind closed doors.